How Can NZYMES Help My Pet? Pets Require More than Just Processed Foods! Every pet, young or old, should have a daily source of “live nutrition”, complete with the live enzymes that are vitally necessary to enabling critical processes within the body, such as helping to replenish bodily resources. The ‘resources’ we elude to are the “antioxidant enzymes” that are produced in vast quantities in a young animal (or person). Those enzymes are responsible for many cellular processes related to slowing aging. First off, they help to cleanse toxins and free radicals from soft tissues, especially in and around joint structures. Secondly, they aid in maintaining or restoring the normal or effective function of the body’s immune system. Our NZYMES® provide nutritional FUEL a body can utilize to increase natural production of the antioxidant enzymes at levels closer to youthful days. 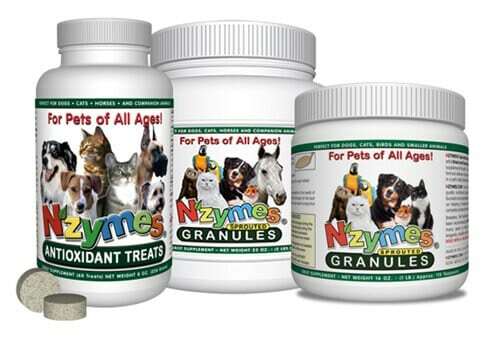 With 3 great choices, you can give your companion animal a concentrated ‘whole live food’ supplement, which includes enzyme-rich nutrients and antioxidant vitamins like those in NZYMES® Antioxidant Treats (in tablet form) or in our NZYMES® Sprouted Granules in either the economical 2-lb jar for large animals, or the NEW 1-lb jar, which is perfect for Cats, small Dogs, Birds or other companion animals. This ‘granular’ version is the raw or ‘base’ form or our antioxidant support products, and is the perfect choice where optimum economy is desired. 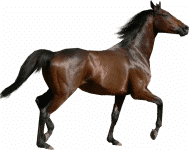 Many families use the 2-lb jars for their equine needs – taking advantage of Quantity discounts while acquiring enough product to sustain their horse for a lot of months. See All Antioxidant Products. Nutrition conscious veterinarians and pet owners have recommended these powerful formulas for many years to help support Musculo-Skeletal Joint health, Immune System Health, Respiratory Health, Skin and Coat Health, Cardio-Vascular Health, Digestive Health, and to support vitality in animals of all ages. The primary food source in NZYMES® Sprouted Granules and Antioxidant Treats is dried and ground sprouted soy ‘protein’. This LIVE ‘super-food’ resource is rich in dietary or live-food enzymes, which provide benefit to the body far greater than any ‘vitamin supplement’ one might consider. The essence of how this nutrition helps the body to perform wonders testified to on this site is that…it “provides resources fundamental to stimulating the production of the body’s own Antioxidant enzymes to a level consistent with more youthful days of the animal”. See our Soy Nutritional Profile to learn more about this super-food. And, to better understand these statements, there is no better demonstration of how the body responds to a daily dose of such special nutrition, than to witness some of our incredible RECOVERY VIDEOS. Side Effects Questions? People often ask about NZYMES® side effects. The NZYMES® antioxidant support products are NOT medicine, and therefore have no known “side effects” that would normally be associated with man-made substances. And, as described in the paragraph above, the NZYMES® are simply a “whole live-food source”. However, pets sometimes react to new food sources in the diet with temporary loose stools or things of that nature. While it has been ‘extremely rare’ that a pet cannot use the product – for one reason or another – we have seen a few of those instances over 17+ years. If beginning to use one of the products and issues are observed, please call us for discussion and recommendations. How do Cooked and Processed Foods Affect my Pet’s Health & Longevity? A pet nutritional study by Dr. Francis M. Pottenger demonstrated that a ‘lifelong diet’ of processed or cooked foods as the main reason why our domesticated pets develop chronic degenerative diseases , infections and other maladies. 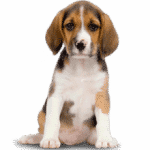 “Dog health” problems can come from a lifetime of enzyme empty diets. These diets weaken a pet’s genetic structure and have even been shown to contribute to increased problems in succeeding generations. The Truth About Most Pet Foods! If you feed one of today’s popular pet foods, then chances are, your pet’s body is depleted of the primary enzyme precursors nature provides abundantly in all living foods. Most commercial pet foods are made from inferior quality ingredients. Labeling is deceptive and designed to avoid disclosure of the true ingredients. Live food enzymes are destroyed during cooking and processing. Chemical additives are used to improve the appearance and flavor. Preservatives , which are potentially dangerous, are used to avoid spoilage. By-products are frequently contaminated with bacteria.